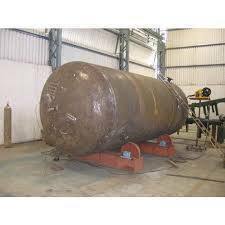 Industrial High Pressure Air Tank also are one of the most efficient and exclusive quality materials of our company which we are exclusively manufacturing and supplying in several regions of the country. These high pressure air tanks are used for the installation in a comprehensive range of industrial machinery as well as automobile manufacturing to retain the consistency in the pressure of the valves or internal chambers. These high pressure air tanks are used and appreciated in several parts of the country and are also in enough demand in the market. MTS ENGINEERING SERVICES was founded in 2003 with a mission to provide high quality mechanical engineering solutions, project management and engineering services to meet Industrial Utility needs. The principal of the firm Mr. Ajay Jhingon is highly qualified with over 40 years of practical experience. With him at the helm, MTS Engineering Services has become a provider of engineering solutions backed by well qualified personnel in different disciplines. He is now assisted by his son Mr. Mayank Jhingon. MTS provides engineering solutions under two business verticals - Mechanical Engineering Solutions, and Solar Energy Solutions. 1. High Speed Diesel (HSD) Storage Tanks & Distribution Systems. 2. Propane/LPG Storage Bullets & Distribution Systems. 4. Heavy Furnace Oil (HFO) Storage Tanks & Distribution Systems. 10. Light Diesel Oil (LDO) Storage Tanks & Distribution Systems. 11. Industrial Chimneys fabrication and installation. 16. Utility Piping for LPG/Propane, HSD, HFO, LDO, RO Water, Chilled Water, Hot Water, Steam (IBR approved), Firefighting, and Compressed Air in Mild Steel (MS), Carbon Steel (CS), Galvanized Iron (GI), and Stainless Steel (SS) constructions. All of these systems can be automated according to the logic required by the clients. These systems have standard accessories for their normal working. Additional safety features such as leak detection systems, alarm systems and measurement systems for quantity of fuels used are also under our scope depending on the client’s requirement. Approval of these systems from CCoE, Nagpur (in relevant systems) is also under the scope of MTS Engineering Services. a. On-grid/Grid-tie systems (residential, industrial, institutional). b. Standalone Systems with Battery Backup. i. PV-Grid Hybrid systems with battery backup . ii. PV-Diesel Hybrid systems with battery backup. 3. Solar PV Street Lighting Systems: Various type of street lighting options are available. We would like to be considered for Industrial projects and housing societies for this application. With years of combined experience, we at MTS Engineering Services, fully understand that quantity without quality is of no meaning and as a rule, we never compromise on the latter.